What’s a beautiful limestone cave like you doing in a volcanic archipelago like this? Sawa-i-Lau is a bit of a geological puzzle. While the rest of the Yasawa archipelago is volcanic, Sawa-i-Lau island is made of limestone. Beautiful sheer white cliffs reach up to the sky over the water, the “beach” as such is stone rather than sand, and best of all the gradual trickle of water over limestone has worked its fabulous magic over the last few millennia and carved out a stunning limestone cave near the southern edge of the island. Exactly why or how it came to be there, nestled amongst all the volcanic islands around it, is a bit of a mystery. But that doesn’t stop it from being one of the most interesting parts of any Yasawa Island Hopping adventure. I’m calling swimming in Sawa-i-Lau the worst kept secret in the Yasawas because it’s so wonderfully easy to do once you’re in the far north Yasawa Islands, but something it seems few people have even heard of before you get there. But let me tell you – quick trip here is absolutely worth it. Because you get to swim in a cave. And it’s really beautiful. Jump in a water taxi for about FJ$50 return, and soon you’ll be zipping up the coast, watching more beautiful tropical islands blow past. As a regular, non-multi-millionaire, this is basically as far north as you can get in the Yasawas, because the northernmost Yasawa Island is actually a private resort. But the further north you go, the more untouched things become. I shared my water taxi with a lovely Fijian woman and her niece. She grew up on Nacula Island, but moved to New Zealand a few years ago. Her heart is still in the Yasawas though, and she was going back to the caves for the first time since she was married. Disembarking, you can see right away that this island is very different from the volcanic peaks and sand atolls that make up most small Fijian islands. The caves aren’t far at all, just a quick walk up some stairs then down into the turquoise depths. It’s really hard to capture just how beautiful these caves are, and the view you get from swimming through them is totally unique. I really need to get a water-proof camera. The sunlight streams in through several skylights and the vegetation growing just outside makes you feel like you’ve stepped back in time to some previous age. The water is a mix of salty ocean and the fresh water that has carved the cave, and it feels clean and refreshing. The water is bluer in here too, because of the limestone dissolved in the water. But that’s not where it ends. If you have a bit of courage, you can go into the second cave – but you have to swim under the ledge. I was lucky enough to be there at low tide, which meant while we still had to swim under, it wasn’t as far or deep. Inside the second cave, the only light comes from the water, sunlight filtered through from the other side. It’s quite big, and the local guides will bring a torch so you can see around a bit – it’s an experience like nothing else. 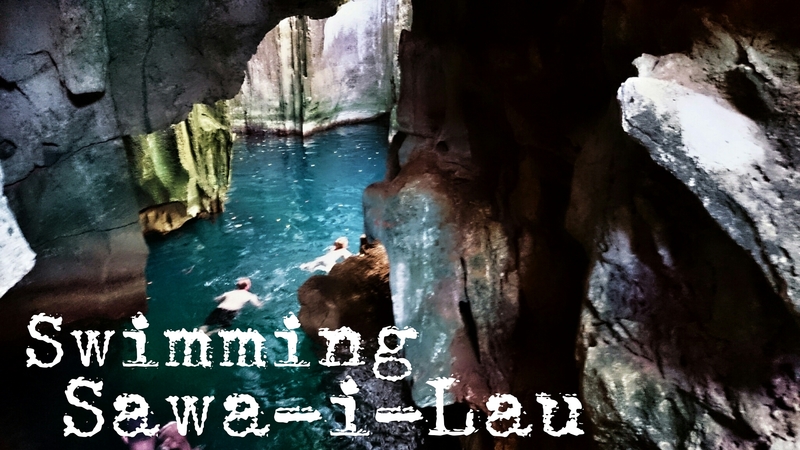 I wanted to do a separate post on Sawa-i-Lau because I wanted to emphasise it – seriously, don’t miss it. It’s one of my favourite places in Fiji (so far!). Have you swum in caves, here or somewhere else? What was it like? Wow! Fiji is just eye-popping, from Savusavu, to the Yasawas. The cave view is stunning. I love the play of colors too, and your narration is wonderful. I must say, I’m uber impressed with your blog Martina. You’re so darn adept at telling stories both visually, and with words. We’re leaving tomorrow morning. Definitely ready to move on to Bali but we’re sad, because we loved our 4 months here. We’ll miss the people, the beauty, and our beloved cats, but it’s all part of traveling, right? Thank you so much for the kind compliments! 🙂 I’m still working on finding my style, but getting there slowly, I think. I stayed at Blue Lagoon Resort on Nacula island last April & did the cave trip. I agree, it is stunning although I didn’t have the nerve to go into the next cave. On the way back to the resort we got the unexpected surprise of having a giant sea turtle surface right next to the boat. Fiji is just an amazing place! A giant sea turtle!!! Wow, what an experience!! How big was it? I’ve seen sea turtles while snorkelling and scuba diving, but only small or mid-sized ones, maybe 40cm across the shell. That would have been such a wonderful thing to happen. Great Post, and I am a big fan of your travel blog (I’m only finding my feet with mine). I’m about to head to Fiji as my next destination and staying at Denarau. How do I get to these caves? Fiji is amazing and you will love but can I make a big suggestion? If you haven’t already paid for your accommodation, don’t stay in Denerau. It’s kind of like the Disney-land version of Fiji, and it’s in Nadi which is a major city (as far as Fiji goes anyway) so you don’t really get the full tropical island experience. If you want stunning postcard Fiji, you need to head out to the islands. The Mamanucas are super accessible but a little expensive, the Yasawas are stunning, the Coral Coast is really easy to get to, and that’s just the places within a few hours on Nadi airport. The easiest way to the caves is to stay at one of the backpackers or resorts in the northern Yasawa islands, such as Blue Lagoon, Oarsman’s Bay, Coralview, Otto & Fanny’s, etc – have a look at the Awesome Adventures website for all the options. All those places offer easy trips by water taxi to the caves for about $50 FJ. If you’re not staying in the area, it’s a little trickier, because the caves are pretty remote. If you’re really well off, you could probably get a water plane or a helicopter to take you, or slightly cheaper would be chartering a yacht or other boat overnight. I hope that was helpful. There aren’t really public transport options because the Yasawas are pretty sparsely populated. Locals just take the tourist boats such as the Yasawa Flyer or have their own little boats. I hope you have a great time!!!! Ive read so much of your entries regarding Fiji and they’re really helpful. I do have a few questions though, and I was hoping you could help! My dear friend and I are planning to backpack in Fiji from December to May, and we plan on wild camping (the hammock version). Is the only way to get to islands like these by staying in resorts? It doesn’t sound like there are very many options to island hop, which is what we had planned on doing. I’m also wondering about prices… And do you think it’s likely that we could just hitch a ride from someone going that direction? A side note- I remember reading something you wrote that said it’s impolite to stray from the path because you may be on Fijian farm land… We had planned on walking all over everywhere. Is this dangerous? And is there an abundance of wild fruit? Really hoping you can answer some/all of my questions. I’m so glad you’re enjoying my blog! But I’m going to be a downer right now – when it comes to walking everywhere and camping – DON’T!! The reason is because the Fijian concept on land ownership is very different to the Western concept of land ownership. We tend to put a fence around “our” land, so it’s really obvious when you’re on private property. But a lot of land in Fiji is communally owned by whole villages, and there are no fences to delegate what belongs to who. This means that as a foreigner you won’t be able to know when you’re on private land or not. And for the most part – you will be! Entering a village or crossing village land without permission is SUPER rude. Would you like it if a stranger walked into your bed room? It’s the same thing – villages in Fiji are a different concept than villages and town in the West. You CAN’T enter them unaccompanied or without permission. Will anything happen to you if you do anyway? Look, probably not, but there are stories. For the most part, the locals will just be really angry (though they might not show it in a way you recognise, because Fijian displays of emotion can be different than Western displays of emotion). But I did have a few older Fijian men tell me stories about foreign travellers who were found dead after trespassing in a village, and the attitude was very much ‘well they deserved what they got’. I think it’s pretty unlikely that that would happen to you, but I’m also pretty sure it has happened before. As far as island hopping goes – you’re right, there aren’t many options. To make the big crossings, the ferries are good value and a fun experience, but they often leave at odd times like 4am. To hop between smaller islands, such as the Lomaiviti Group, the Mamanucas Islands or the Yasawa Islands, there are public ferries and private water taxis. Most hotels operate water taxis that will take you where you want to go. You might also be able to find a local with a boat who will take you for a ride. The cost will be about the same, and it will reflect the cost of fuel in remote areas. If you ask around, you might be able to tag along with a group who are going to the market or something – this will bring the price down. Many of the smaller islands in Fiji don’t have fresh water. Those that do have villages and resorts. And I can’t emphasise enough – don’t go to a village without an invitation. Towns are fine, but not villages. Another option for island hopping is begging or bartering your way onto a yacht. Some yachties take travellers in exchange for a bit of work. I’m not sure how you’d organise it, but look online and ask around in places like Savusavu and Suva. An economical option for exploring Viti Levu and Vanua Levu (the two big islands) is bus. It’s cheap, entertaining, easy enough to get a ticket, and you’ll see some great country. It can be squishy though. You could probably also hitchhike where there are roads – usual risks of course. You mentioned fruit – it’s nearly always owned by someone. You might be ok pinching a few bananas from a tree by the road, but they probably belong to someone. Same with mangoes and papaya. Regarding costs – Fiji is medium-priced. It’s nowhere near as cheap as South East Asia or Central America, but not as expensive as Australia or Western Europe. Plan accordingly. Hostels and backpacker resorts are $20-$40 FJD, food is $1-$15 FJD, a bus is $5-$10 FJD, a boat is $30-$50 FJD.